202 W. Walnut - Rogers, Arkansas 72756 - Directions! Listen to a sample of our tour! The 1880's - "It's a Daisy!" The year was 1886. France had just given the bright copper Statue of Liberty to the United States. Coca-Cola had just been invented and was only available as a syrup mixed with soda water. The Plymouth Iron Windmill Company in Plymouth, Michigan, just outside of Detroit, had for four years been making iron windmills for farmers. However a premium item, given free to farmers who purchased these windmills, was about to change that company's destiny. Windmill sales did not take off as expected and the company came close in 1888 to liquidating. 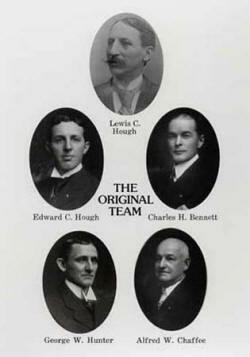 The vote failed by one vote - that of General Manager Lewis Cass Hough. While the "Chicago" air rifle--made almost entirely of wood - had been made since 1885 by the Markham Air Rifle Company of Plymouth, Hamilton was the first to develop a metal air rifle. After firing the gun (first at a basket of red-ink covered paper and then an old shingle), Hough exclaimed in the slang of the time, "Boy, that's a Daisy!" and later convinced the Board of Directors to use the metal air rifle as a premium item. 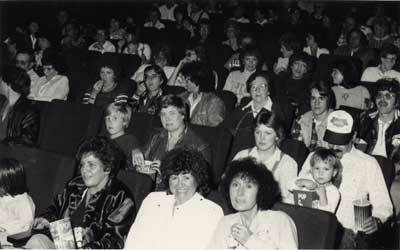 The popularity of the premium item was huge. Farmers were more interested in the "Daisy" than the windmill-- so much so that the focus of the company shifted from windmills to airguns. By 1890, the twenty-five employees of Plymouth Iron Windmill Company were producing 50,000 guns, most of which were distributed within a radius of one hundred miles of the factory. "I am not a good shot, but I shoot often." you can shoot both straight and often." 1891 - Charles Bennett is hired to serve as the Company's first salesman at a salary of $85/month plus expenses. Two days after being hired, Bennett makes a trip to Chicago and sell 10,000 guns to Hibbard, Spencer, Bartlett & Company. The order is filled in 6 months. 1893 - Edward C. Hough joins the company to keep the books part time while continuing to run his father's grain elevator business. 1895 - The Plymouth Iron Windmill Company gets out of the windmill business for good and changes it's name to Daisy Manufacturing Company. By the end of the 19th Century, Daisy had established itself as the dominate force in the burgeoning air gun industry, having seen the appearance and demise of some 30 competitors during its first decade. The company continues to hold that market-dominant position today. Daisy suffered a major loss with the death of Lewis Cass Hough on January 11, 1902 at the age of 56. L.C. Hough was one of the founders of the Plymouth Iron Windmill Company and as General Manager had fought hard to keep the struggling company operating during its early years. With his passing, C. H. “Uncle Charlie” Bennett was named General Manager and E. C. Hough, son of L.C., was named Secretary/Treasurer. For the next 60 years this remarkable team directed the affairs of Daisy. In January of 1903 Daisy introduced its first lever action repeater, the No. 3 which was a nickel plated, 1,000-shot rifle, that was to become the hallmark of Daisy styling and set the tone for forward thinking innovation that has served Daisy so well though the years. The new little rifle so captured the attention and interest of wholesalers and consumers that it sold over 36,000 units the first year. With the advent of the 20th Century, Daisy’s export business was approaching 25% of its total annual sales without any real effort on the part of the company. At that point Charlie Bennett determined to pursue the international market and rather than hire someone for that purpose decided to pack up and make the world tour himself. From April to September 1907 Mr. Bennett traveled the world establishing Daisy’s export market. His trip, especially the China leg, is one of the many interesting stories related at the Daisy Airgun Museum. A month later Lefever arrived in Plymouth and remained a part of Daisy until his retirement in February 1953. During the ensuing years Lefever designed and engineered such Daisy classics as the Model 25. That remarkable pump gun, which was first produced in 1914, continued in production for the next 64 years until it was dropped from the line in 1979. At the time it was discontinued more than 8,000,000 of the guns had been produced and sold. Within two years of his arrival he had also designed the first water pistol and with the outbreak of World War I in August 1914, the Model 40 Defender which was an instant and overwhelming commercial success. The first handmade prototype of Lefevre’s Model 25 pump gun is on display at the Daisy Airgun Museum. In the early days of air rifles, shot tubes were sized to utilize lead drop shot that was approximately .180 inches in diameter; a size referred to as “BB”, hence the name “BB gun”. Shortly after the turn of the century, seeing the potential in the air gun ammo business, Daisy prevailed upon the makers of lead shot to create a special size ball with an average diameter of .175 inches and call it “”Air Rifle Shot”. However, the name “BB” stuck and is still in common use today. In the mid 1920’s Daisy began to experience an unusually high rate of returns the source of which was ultimately traced to the American Ball Company in Minneapolis, Minnesota, a manufacturer of steel ball bearings. Apparently, enterprising young lads in the area were salvaging bearings from the scrap out back of the plant to shoot in their guns. While some scrap worked well in the guns, some was oversize and either jammed or split the shot tube. When this was called to the attention of American Ball Company, some quick market research on their part revealed that there was a bigger market for air rifle shot than for their particular brand of bearings. Armed with this information they began manufacturing and selling steel balls in a size approximating air rifle shot under the brand name “Bulls Eye”. Because steel shot was less expensive to manufacture and performed better due to its lighter weight, sales skyrocketed. Quick to realize their return problems were only going to compound Daisy redesigned its shot tubes to accommodate the “Bulls Eye” ammo and negotiated an agreement to become the exclusive sales agent for American Ball. The arrangement continued smoothly until Daisy, acquired the assets of American Ball Company in early 1939. The 1930's - The Busy 30’s! In company with most other businesses, Daisy entered the 1930’s suffering losses in sales and profits because of the state of the national economy. As the depression wore on Daisy learned that with fresh new advertising and sales promotion it did not have to “…take its lumps” with the rest of the world. It set up a pattern of promotional activity that is still the hallmark of the Daisy operation today. One devise used to generate business during the depression was an offer for youngsters to trade in their old BB guns for new models. Much that came in was pure junk but a surprising number were in remarkably good shape and now make up much of what is on display in the Daisy Airgun Museum. The 1930’s also saw Daisy advertising and promotions take on new directions that were to keep it operating at full capacity throughout the tough depression years. The first of those was a tie in with a young cowboy circus star named Buzz Barton. An instant sales success, another quickly followed with the most popular cowboy movie character of the time, Buck Jones. The most successful, however, was taken from the pages of the newspaper comic strip Buck Rogers and the 25th Century. Introduced in 1933, the Buck Rogers Rocket Pistol was an instant success and was quickly followed the next year by the Buck Rogers Disintegrator Pistol and finally in 1935 by the Liquid Helium Pistol. All of which set sales records year after year. Much of this ground breaking advertising and promotional material from the 1930’s is on display at the Daisy Airgun Museum. The 1940's - "Howdy Podner. My Name’s Red Ryder!" 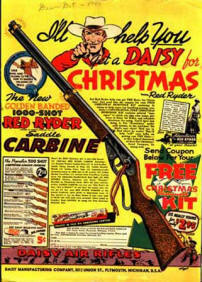 With the ground work firmly laid by the innovative promotions of the 1930’s, Daisy was ready to launch into its most successful promotion ever; the Daisy Red Ryder! Based on the popular comic strip western hero, the new gun was introduced in the spring of 1940 and produced until mid 1942 when Daisy’s production was converted to the war effort. Following the war, the air gun was reintroduced in November 1945. By 1949 it had become so popular that more than one million units were sold in a single year; a sales figure unheard of at the time! In fact, the Red Ryder had become so popular that on more than one occasion mail was received at the Daisy offices in Plymouth, Michigan addressed simply to the “Red Ryder Company”. The Red Ryder was and sill is the best-known BB gun ever built and a special display of Red Ryder BB guns at the Daisy Airgun Museum follows the progression of the Red Ryder over the years. It was also in the late 40’s that Daisy introduced the famous penny pack of BBs wound in a long roll of individual cellophane segments allowing a youngster to tear off as many packs as his finances would support. 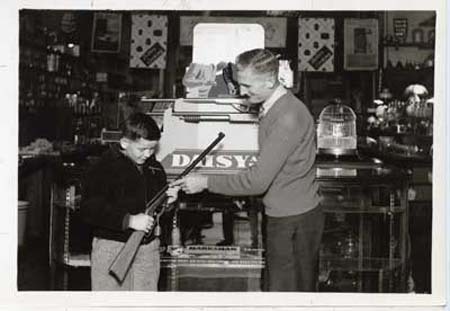 During the years of World War II, companies such as Daisy were prohibited from using steel and other strategic materials for production of products such as BB guns which were non-essential to the American war effort. 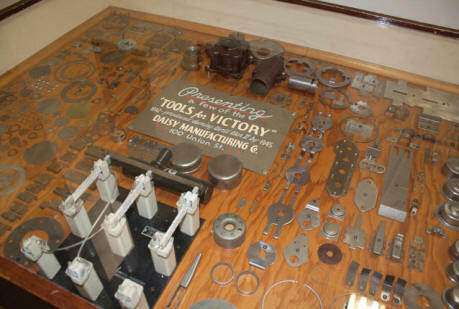 Instead, production was focused on items ordered under War Department contracts and sub-contracts, such as the parts you see displayed in the flat case. Gaskets were produced for AC Spark Plug Division, switches for Square D Manufacturing, ball races for Palmer-Bee, washers for Ligon Brothers, and dies for Bendix Aviation, Nippert Electric and Pilgrim Drawn Steel. Of the company’s total sales from 1942 to 1945, almost 24% were from products for the war and the balance were from non-steel toy products. Colonel Cass Hough (then vice president and later president of Daisy) went on extended active duty in the 8th Air Force, just six months prior to the attack on Pearl Harbor. A decorated test pilot and fighter pilot, he didn’t return from overseas until October, 1945, having won many an air battle from the English Channel to New Guinea. Most notably, he had the distinction of having tested the limits of the Lightning P-38 in an experimental, yet successful, 43,000-foot vertical dive during which the plane broke the sound barrier. The banner and Roll of Honor you see here were proudly displayed in the Plymouth, Michigan plant where they saluted those in active military service during World War II. Throughout history and numerous wars and conflicts, Daisy remains grateful to and proud of our employees who have so selflessly served our country, distinguished themselves and even made the ultimate sacrifice for freedom. The 1950’s saw the loss of the two individuals whom, more than any others, guided Daisy to its position of dominance in the American airgun industry. On September 17, 1956 “Uncle Charlie” Bennett passed away at the age of 94. Up until a few weeks before his death he never failed to put in a daily appearance at the Daisy office. Less than 2 years later on January 24, 1959 E. C. Hough died at the age of 86. With their passing, Daisy lost the team that had guided it through three major world conflicts, three devastating economic downturns, and past countless competitors both large and small to emerge as the company whose name was synonymous with the BB gun. By the late 50’s the antiquated Daisy factory was becoming increasingly less efficient as modern manufacturing processes progressed. This factor coupled with spiraling taxes and a tightening labor market caused Daisy to begin a search for a new location more central to its distribution. The search, quietly carried out over a period of months, finally centered on a small northwest Arkansas community. On April 30, 1958 Daisy closed its doors for the last time in Plymouth, Michigan and the first train cars full of machinery started south to Rogers, Arkansas. July 1, 1958 was the target date to begin production in its new location but the first gun came off the line on June 26th four days ahead of schedule. Daisy’s relocation to Rogers, Arkansas in 1958 represented the first major investment by industry in this highly rural region. It preceded the area’s ultimate development into the hub of Arkansas’ economy. Today the market area (now referred to as Northwest Arkansas) is home to numerous corporate offices including the world’s largest retailer and poultry producer. 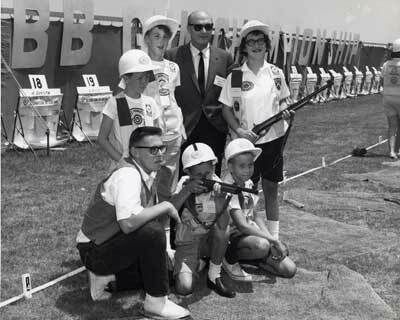 Early in 1963 Daisy partnered with the U.S. Jaycees to launch what was ultimately to become the nation’s largest and most far reaching youth Shooting Education Program. To date the grass roots program has taught more than 10 million young boys and girls the fundamentals of safe gun handling and marksmanship. It concludes each year with the Daisy National BB Gun Championship Match (The Daisy Nationals.) The first of these was held in July, 1966 in Vandalia, Ohio and the national match now continues annually in Daisy's hometown of Rogers, Arkansas. Today the concept has expanded to include cooperation with such groups as the Boy Scouts, American Legion, NRA Junior Clubs, high school JROTC units, the Royal Rangers, 4-H, and USA Shooting, the governing body of US Olympic shooting sports. This year's annual Daisy Nationals will attract over 400 5-meter BB gun shooters, 100 10-meter sporter pellet rifle and pistol marksmen, plus coaches, parents and family members. The 60s also witnessed the introduction of Daisy’s highly successful Spittin’ Image line of air guns patterned, to the smallest detail, after famous firearms. The first and best selling of these was the Model 1894 built on the lines of the famous Winchester 94 carbine. Other such notables included the Model 26 Remington Fieldmaster and .45 Colt Frontier revolver. No mention of the 60s would be complete without reference to the V/L Caseless Ammunition system. The V/L was and is, to this day, a totally unique gun utilizing super heated air to ignite a propellant affixed to a .22 caliber bullet that required no brass casing. Named for its inventor, Jules Van Langenhoven, the gun and ammo were first announced to the public on August 20, 1962. The Daisy Museum’s collection contains several Spittin’ Image examples, V/L guns and ammunition and a wall which salutes the company’s history as the leader in shooting education. As far back as the late 1930s, Daisy had been tracking developments in pneumatic systems for higher-powered air guns, not because it was considering a move in that direction, but because it might offer insights into more efficient systems for its spring air guns. In fact, it wasn’t until 1970 that Daisy decided to make the move to high-powered adult air guns. Young adults were demanding more sophisticated equipment and there were increasing restrictions on area for shooting firearms. By 1972, Daisy’s first pneumatic air gun was off the production line and ready to roll out to the trade. The Model 880 pump-up air gun was an immediate success. To this day, it is still a part of the complete line of high-powered adult air guns offered by Daisy. The fact that the gun never existed (the gun described was actually a combination of the Red Ryder and an earlier gun, the Buck Jones Special) did not deter the movie production company. In spite of repeated warnings that “…you’ll shoot your eye out!”, in the end Ralphie got his gun. The movie was an instant box office hit and is now a cult classic that can be seen each year on television from the day following Thanksgiving through Christmas. In the late 1990s, in a continuing effort to control costs, improve efficiency and ensure quality, the company began purchasing components from highly specialized manufacturers. In becoming an assembly operation, Daisy no longer required the large manufacturing facility built in Rogers, Arkansas in 1958. In 1995 Daisy acquired Brass Eagle in order to offer a complete line of paintball markets. (Daisy had manufactured markers for the forestry and cattle industries since the 1970s). While Daisy Manufacturing Company’s corporate headquarters, customer service operations, some assembly operations and BB shot manufacturing remained at the plant at 2111 South 8th Street in Rogers, Brass Eagle operations were located to an assembly facility in Granby, Missouri. From April, 1996 until November, 1997, some Daisy products were also assembled in the Granby facility while other production lines remained in Rogers, Arkansas. When the paintball business became sufficient to stand alone, the two companies were separated and stock in Brass Eagle was offered to the public in November, 1997. However, by April, 1997, Daisy Manufacturing Company had selected an underground location in Neosho, Missouri for its assembly operations. The limestone walls of the underground facility provided insulation from outside temperatures. 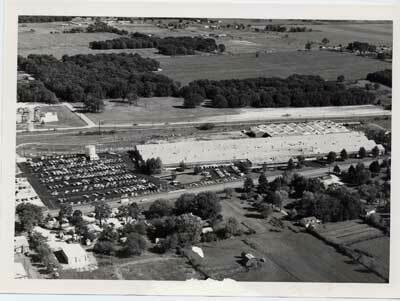 The Neosho facility was headquarters for not only assembly operations, but for the purchasing, shipping and receiving, engineering research and development and quality control staff. The corporate offices continued to remain in Rogers as they had since 1958. 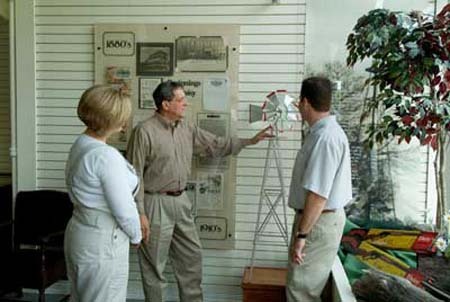 Since the company had sold the old plant on 8th Street in July of 1999 and relocated their office to an industrial park in the north part of Rogers in November, 1999, the Daisy Museum needed a new home. We found it in a 1906 bank building at 114 South First Street. The building had a lot of architectural character with archways and mosaic tile floor. It was easy to make our antique airguns and displays look right at home. The City of Rogers Parks & Recreation Department had agreed to run the Daisy Museum on a day to day basis with Daisy’s support. Several Daisy retirees, devoted to the Museum’s preservation, founded a non-profit organization called “Friends of the Museum” which provided much needed support. In March, 2000, Arkansas First Lady Janet Huckabee shot a balloon tied in the middle of a ribbon to officially mark the opening of the Daisy Airgun Museum. Daisy’s new product introductions for 2000 included PowerLine pistols models 400 GX, 45 and 645. TruGlo® fiber optic front sights were made standard on most PowerLine rifles and the PowerLline brand of slingshots were introduced. Daisy licensed the Winchester brand in 2000 and introduced a line of Winchester(R) Air Rifles at the Shooting Hunting and Outdoor Trade (SHOT) Show in early 2001. The initial lineup included walnut-stocked, .177 cal. pellet breakbarrel rifles with maximum velocities of 600, 800 and 1000 fps. There was also a model 722, a .22 caliber version which had a maximum velocity of 700 feet per second. New introductions at the SHOT Show in 2001 also included the AirStrike model 240 soft air pistol kit and the PowerLine 622 pellet pistol which featured a 6-shot rotary clip for .22 cal. pellets. Ray Hobbs was named President, Chief Executive Officer and Chairman of the Board of Daisy Outdoor Products in 2001. Ray has brought to Daisy a wealth of related industry and retail experience as well as leadership expertise to our management team. His vision for Daisy continues to contribute to the company’s consistent growth. Daisy secured a contract with the U.S. Navy in 2001 to produce nearly indestructible drill rifles which are being utilized by the U.S. Navy, honor guards, color guard and drill teams nationwide. At first glance, the Daisy drill rifle looks like a fully functional 1903-A3 Springfield rifle with a black synthetic stock. The design and durable steel components and synthetic stock make this drill rifle capable of withstanding the abuse that is inherent in drill team use. In 2002, the company introduced the 15XT BB repeater pistol and ShatterBlast targets, the only breakable airgun target on the market. In June, 2002, the company took delivery of a custom-designed Mobile Airgun Range. The 18 foot steel trailer houses a 5-meter, two shooting point range, complete with electric target runners. At the SHOT Show in 2003, the company introduced several kits, the PowerLine 617X pistol (a six-shot .177 cal. semi-auto) and The Natural line of slingshots – the only ergonomically designed slingshot that allows the wrist to be in the most natural position when the forks for the slingshot are perfectly vertical. The Model 1894 was reintroduced under the Winchester® Air Rifle brand as a lever action 15-shot BB repeater. Daisy had relocated the corporate offices from the old plant on South 8th Street to 400 West Stribling Drive in Rogers in 1999 but the BB manufacturing division remained operational in that building until 2003. A tremendous undertaking, the company moved the BB production equipment to a new location in Salem, Missouri in March, 2003. In 2004 the Winchester breakbarrel line was expanded to include black and synthetic stocks and scoped models. January 1, 2004 a non-profit corporation was founded, The Daisy Airgun Museum. The Daisy Museum collection was donated to this non-profit and it was charged with the task of operating the Daisy Museum with revenues coming from admissions, gift shop and internet sales and donations from members, the Friends of the Daisy Museum organization and support from Daisy Outdoor Products. On October 25, 2004 the Daisy Museum relocated to the southwest corner of Second and Walnut streets, the highest traffic intersection in Historic Downtown Rogers. The new location is an historic building, dating to 1896 and known to many residents as the former Rexall Drug building. The new location offered the Museum an opportunity to build a maze of interior walls, further defining periods in Daisy’s history. The new chronological arrangement of antique airguns, advertising and memorabilia offers a more cohesive presentation. In conjunction with the Museum relocation, the staff hosted a relocation celebration and open house on Sunday, November 14th with a ribbon cutting and silent auction. This date also marked the launch of a fundraiser to refurbish and relocation of the old Daisy sign. On January 31st, 2005, the Daisy Museum, Daisy Outdoor Products and many of you suffered the loss of a wonderful friend. David Gates had been a high school coach in Plymouth, Michigan when the president of Daisy asked him to write a shooting education curriculum during the summer school break in 1955. David did so, and never went back to coaching at the school. He moved his family from Michigan to Arkansas in 1958 and held many positions with Daisy until his retirement. But he was always involved in education – Daisy’s shooting education programs and as a member of our community’s school board. David was instrumental in the efforts to establish the Daisy Museum in 1999. He was one of the curators when it opened on First Street in March, 2000. He truly loved Daisy and the Daisy Museum and worked hard up until the day that his health no longer permitted. David was a mentor to many of us. He was a valuable counsel. It’s not enough to say that he was a great and true friend. David was a coach. In 2006, Daisy celebrated its 120th anniversary. We are humbled by the fact that we are one of only a handful of companies that have excelled at making the same product continuously for 120 years. Our staff is grateful for the opportunity to continue to serve in this exciting gratifying and fun industry. We’re proud to have grown this business, preserved this great old Daisy brand and defended our position as the market leader in airguns. Along the way, we’ve had the pleasure of developing products, traditions and memories for several generations. Most Rogers residents and many Rogers visitors remember the old 1960 neon Daisy sign with lights which imitated the movement of BBs hitting a target. In July, 1999, four months before the company moved its corporate offices from 8th Street in Rogers to 400 Stribling Drive, the old sign had been dismantled and put in storage by the Rogers Parks Department. In 2001 the Daisy Museum began a fund-raising campaign to restore the sign. The sign was re-erected in front of Daisy headquarters on May 9, 2007 and a dedication ceremony was held on May 14th. June 20, 2007, Daisy President & C.E.O. 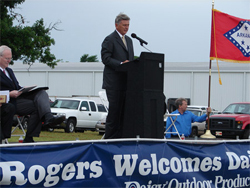 Ray Hobbs and Arkansas Governor Mike Beebe, made an announcement at a press conference held under a tent in the field in front of Daisy’s offices: Daisy is coming home to Rogers. After ten excellent years of assembly operations in Neosho, Missouri, Daisy would relocate the entire operations under one roof, in the same facility in which the company had housed their offices since November, 1999. The move was made in record time and on July 25, 2007, the first Red Ryder came off the production line. In 2008, Daisy celebrated 50 years in Rogers, Arkansas. The City of Rogers and Daisy hosted a four-day weekend celebration which was called a Homecoming. In addition to Daisy staff, Daisy Museum personnel, retirees and community friends, 189 Daisy collectors from every corner of the U.S. and Canada, registered for the event. An extremely limited-edition engraved Red Ryder BB gun commemorated the event and was numbered 1 of 189 in honor of the 189 people who registered for and reserved one of the guns. The ticketed event began with a Rogers-Lowell Chamber of Commerce Business After Hours reception under a tent in front of the Daisy offices on Thursday, June 19th. Tours of the Daisy Museum and the Daisy assembly operation were offered throughout the weekend. On Friday afternoon, a picnic was hosted by Daisy and it was Daisy Night at the Northwest Arkansas Naturals baseball game. Saturday, exhibitors displayed and enjoyed a swap meet at the John Q. Hammons Convention Center, adjacent to the Embassy Suites host hotel. On-site appraisals were offered. An activity called “Speed Daisy” allowed registrants to visit with current Daisy staff and retirees to hear their personal Daisy stories. Saturday evening began with a reception and silent auction, filled with unique one of a kind prototype Daisy items and other amazing collectibles donated by those who registered. The group was entertained by “Melody Lane”, a barbershop quartet who sang custom lyrics to the tune of “A Bicycle Built for Two” (a.k.a. “Daisy, Daisy…”). During the banquet, the program, emceed by Joe Murfin, included a welcome from Daisy President and C.E.O. Ray Hobbs and Rogers Mayor Steve Womack. 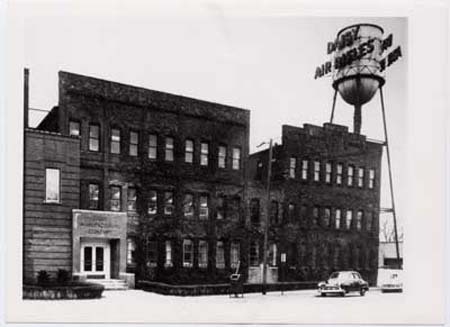 In January, 1999, when I joined Daisy we were still in the office building at the old (1958) plant on 8th street. We had a small room, just off the reception area, which housed six walnut upright cases, against the walls. There were two additional walnut free-standing cases. (These cases were repaired and moved to the downtown facility when it was built-out).There was not really any chronological organization to the presentation of the old Daisy airguns, and there was no gift shop. It was a self-guided tour of the eight cases. The plant and offices were on the real estate market at that time. When the plant was sold in July, 1999, the new owners gave us until Thanksgiving weekend to re-locate. We found office space in an industrial park in the north part of town. We realized that the museum, if it was ever to become a tourist attraction, would not thrive in the industrial park setting. We began looking for a new location and consulted our mayor about our desire to have the museum become a tourist attraction for the City. Our mayor is a real Daisy fan (and a Colonel in the Army Reserves). He was a big help in finding the old 1906 bank building downtown. It was not until our museum was open that we would discover that that building once housed the Rogers Historical Museum. We worked with a local display company to design the “flow” of the museum, refurbish the old walnut cases, select items for display and build it out in time for the opening. The detailed, informative historic timeline we created was to have appeal to former employees, local residents and collectors. We sorted vintage printed material by decade to create displays that allowed visitors to take a walk through our history. Because we had never had personnel dedicated to giving museum tours, and because a new free-standing museum would require several people to staff, we originally spoke to the mayor about asking the director of our City’s Rogers Historical Museum to “absorb” the responsibilities of this new downtown museum and even to house the collection in an annex of the Historical Museum. Because of stipulations in current and potential grants, the Historical Museum’s director wanted to avoid the conflict of managing a “private collection”. The Parks and Recreation director, however, was excited at the opportunity to get involved and volunteered to establish the Daisy Airgun Museum as a City of Rogers Park. Frankly, he was the right man for the right job at the right time – very resourceful. We stored the collection from July, 1999, when we sold the old building, until March, 2000 when we opened the new museum downtown under a partnership with the City of Rogers. The City managed the day-to-day operation of the museum but did not own the collection. It was a unique but beneficial partnership. Being managed by the City allowed us to be adequately promoted by the state tourism department. And, we had a Parks Dept. staff which could cost-efficiently do the type of odd jobs that come up with you’re running a museum. They built cases, repaired displays, mopped, moved things, etc. just like they would at any other Parks facility. Daisy retirees with an interest in preserving the collection and supporting the efforts of the museum created a non-profit corporation. The non-profit was entitled “Friends of the Daisy Airgun Museum” in order to be able to solicit donations of cash and artifacts. Over the course of three years, the “Friends” collected $4,750 in donations to restore the old Daisy sign and in excess of $6,000 in additional unrestricted donations. Long term, however, it was never our intention nor was it ever the City’s intention to operate the Museum jointly. Froom 2000 to 2003, Daisy had continued to subsidize the museum annually so that it would not be a burden on the taxpayers. Therefore, in 2003 we began studying the question of whether it was better and/or more costly to subsidize the Museum or just manage it. We created a business plan for the Museum that included the creation of a new non-profit corporation. The exciting thing about the Daisy Museum today is that it is not owned or operated by Daisy nor is it owned and operated by the City of Rogers. We have created a non-profit corporation which owns the collection, pays for the labor and, in every other way, is responsible for the day-to-day operation of the Museum. In this way, donations of money, antiques as well as the proceeds of Museum sales all go to the Daisy Airgun Museum, a non-profit entity with the sole responsibility of managing and protecting the collection and handling internet and gift shop sales. David Gates, John Ford, Orin Ribar (long-time Daisy associates) and Sue Secker, who were employed by the City under the former agreement, are now retained by the non-profit. The bylaws protect the collection in perpetuity. Charter members of the board of the non-profit originally included Joe Murfin as chairman, Ray Hobbs and Marianne McBeth. In June, 2004, upon the dissolution of the “Friends of the Daisy Museum”, the board created two new positions and elected Orin Ribar and David Gates. On October 25th, 2004, the Museum was relocated to the southwest corner of Second and Walnut Streets. The new location is an historic building, dating to 1896 and known to many residents as the former Rexall Drug building. 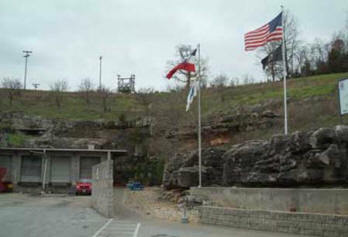 The location was selected for the high traffic count for tourists visiting historic downtown Rogers and passing through town on their way to Beaver Lake, Eureka Springs and Branson. The new location offered the Museum an opportunity to build a maze of interior walls, further defining periods in Daisy’s history. 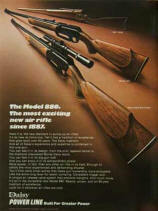 The new chronological presentation of antique airguns, advertising and memorabilia offers a more cohesive presentation. In conjunction with the Museum relocation, the staff hosted a relocation celebration and open house on Sunday, November 14th with a ribbon cutting and silent auction. This date also marked the launch of a fundraiser to refurbish and relocation of the old Daisy sign. Various levels of donor awards were made available and response from Daisy retirees, business associates, community leaders and the general public was generous. The Daisy sign is to be strategically placed in front of Daisy corporate offices, but more importantly strategically placed to lead visitors to the Daisy Museum. The reverse side will thank visitors for visiting historic downtown Rogers. On January 31st, 2005, the Daisy Museum, Daisy Outdoor Products and many of you suffered the loss of a wonderful friend. David Gates had been a high school coach in Plymouth, Michigan when the president of Daisy asked him to write a shooting education curriculum during the summer school break in 1955. David did so, and never went back to coaching at the school. He moved his family from Michigan to Arkansas in 1958 and held many positions with Daisy until his retirement. But he was always involved in education – Daisy’s shooting education and as a member of our community’s school board. David was instrumental in the efforts to establish the Daisy Museum in 1999. He was one of the curators when it opened on First Street in March, 2000. He worked hard up until the day that his health no longer permitted. David was a mentor to many of us. He was a valuable counsel. He was a great and true friend. David was a coach.